service, would be closing down on July 1st. The response was swift and somewhat panic-ridden; thousands of people used Reader on a regular, if not daily, basis- and that included many of the most popular bloggers and journalists. Angry things were written, a petition was signed- but on July 1st, 2013, Google shut the service down anyway. Since then, alternative news services have surfaced- such as one by the well-known but flailing Digg, and some entirely new ones, such as SNATZ.com, which features only technology-related news, and offers news from a wider range of sources. 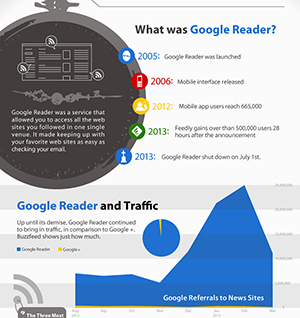 This infographic looks more closely at the Death of Google Reader. Posted in Social Media Tools.